Bumblebees living in the city have genes that differ from those of their relatives in the countryside. Although genetic differences are not major, they nevertheless may influence how well the insects adapt to their habitat. For example, urban bumblebees are probably better able to react to environmental challenges that come with city life, such as higher temperatures. These differences in their genetic makeup are an indication that urban life does impact the evolutionary trajectory of a species, write researchers at Martin Luther University Halle-Wittenberg (MLU) and the German Centre for Integrative Biodiversity Research (iDiv) Halle-Leipzig-Jena in the current issue of the renowned journal Proceedings of the Royal Society B. For bumblebees, life in the city is a two-edged sword. "On the one hand, food is abundant for the insects thanks to the numerous urban gardens and balconies. 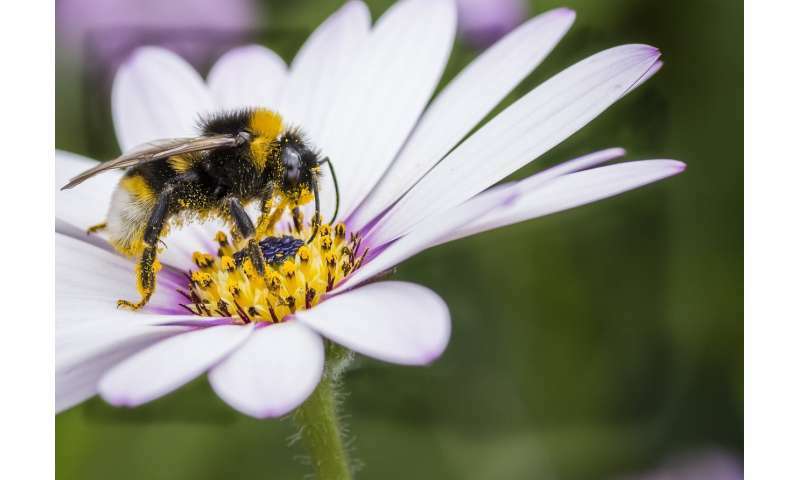 But on the other hand, bumblebees have more parasites and there is a considerably higher degree of habitat fragmentation in cities," says Dr Panagiotis Theodorou from the Institute of Biology at MLU and iDiv. He headed the new study alongside bee researcher Professor Robert Paxton, also from Halle. Cities around the world are expanding, which threatens the natural habitant of many species. "In order for individuals to survive, they have to adjust to the new living conditions. This process should also be detectable in a species' genetic material," says Paxton, explaining the idea behind the new study. In order to test this, the researchers collected bumblebees from nine large German cities and paired neighbouring rural regions and analysed the bees' genetic material with the aid of so-called next generation sequencing. "Overall differences in the genetic material of urban and rural bees are subtle," says Paxton. However, a more detailed analysis of the data revealed that urban bumblebees are consistently distinguishable genetically from their country counterparts. "For example, we detected differences in genes associated with metabolism and environmental stress, such as heat or energetic stress," adds biologist Panagiotis Theodorou. The researchers were unable to identify these changes in the rural bumblebees. The biologists from Halle are unable to say for sure which of the many, different living conditions in cities cause these changes in the genetic material. However, their study is further proof of how plants and animals adapt to an environment shaped by humans and how this is reflected in their genetic material.